Yes. We can see evidence of magnetic polarity reversals by examining the geologic record. When lavas or sediments solidify, they often preserve a signature of the ambient magnetic field at the time of deposition. Incredible as it may seem, the magnetic field occasionally flips over! The geomagnetic poles are currently roughly coincident with the geographic poles, but occasionally the magnetic poles wander far away from the geographic poles and undergo an "excursion" from their preferred state. Earth's dynamo has no preference for a particular polarity, so, after an excursional period, the magnetic field, upon returning to its usual state of rough alignment with the Earth’s rotational axis, could just as easily have one polarity as another. These reversals are random with no apparent periodicity to their occurrence. They can happen as often as every 10 thousand years or so and as infrequently as every 50 million years or more. The last reversal was about 780,000 years ago. Reversals are not instantaneous; they happen over a period of hundreds to thousands of years, though recent research indicates that at least one reversal could have taken place over a period of one year. The USGS film Secrets in Stone tells the story of how records of magnetic reversals helped lead to the evolution of the plate tectonics theory. Why measure the magnetic field at the Earth's surface? Wouldn't satellites be better suited for space-weather studies? What are the hazards of magnetic storms? Does the Earth's magnetic field affect human health? Are we about to have a magnetic reversal? How does the Earth's core generate a magnetic field? Do animals use the magnetic field for orientation? Yes. There is evidence that some animals, like sea turtles and salmon, have the ability to sense the Earth's magnetic field (although probably not consciously) and to use this sense for navigation. Is the Earth a magnet? Could magnetic reversals be caused by meteorite or comet impacts? 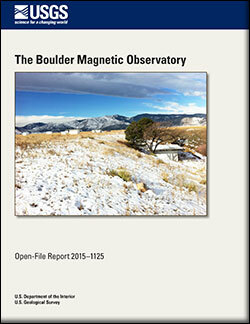 Love, Jeffrey J.; Finn, Carol A.; Pedrie, Kolby L.; Blum, Cletus C.
Love, J.J., Finn, C.A., Pedrie, K.L., and Blum, C.C., 2015, The Boulder magnetic observatory: U.S. Geological Survey Open-File Report 2015–1125, 8 p., http://dx.doi.org/10.3133/ofr20151125. Holmes, Robert R.; Jones, Lucile M.; Eidenshink, Jeffery C.; Godt, Jonathan W.; Kirby, Stephen H.; Love, Jeffrey J.; Neal, Christina A.; Plant, Nathaniel G.; Plunkett, Michael L.; Weaver, Craig S.; Wein, Anne; Perry, Suzanne C.
U.S. Geological Survey natural hazards science strategy: promoting the safety, security, and economic well-being of the Nation; 2013; CIR; 1383-F; Holmes, Robert R., Jr.; Jones, Lucile M.; Eidenshink, Jeffery C.; Godt, Jonathan W.; Kirby, Stephen H.; Love, Jeffrey.J. ; Neal, Christina A.; Plant, Nathaniel G.; Plunkett, Michael L.; Weaver, Craig S.; Wein, Anne; Perry, Suzanne C.
Love, Jeffrey J.; Applegate, David; Townshend, John B. 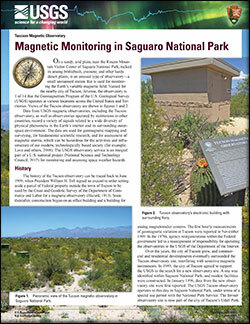 Monitoring the Earth's Dynamic Magnetic Field; 2008; FS; 2007-3092; Love, Jeffrey J.; Applegate, David; Townshend, John B. 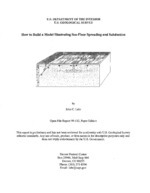 How to build a model illustrating sea-floor spreading and subduction; 1999; OFR; 99-132; Lahr, J. C.
New strides have been made toward quantifying how geomagnetic storms can interfere with the nation’s electric-power grid systems. By using the Earth's magnetic field, combined with new innovative technology, oil and gas drilling companies are increasing oilfield productivity while reducing development costs and environmental impacts. USGS, NOAA Mark 50 Years of Geomagnetic Research at Corbin, Va.
On May 23, 1956, a research center and observatory opened at Corbin, Va. to continuously monitor the Earth's magnetic field. It was charged by Congress "to enhance geomagnetic field studies and monitoring programs in support of scientific, general public, basic and national security needs of the United States." 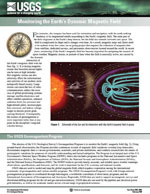 USGS scientist Duane Champion explains the Earth's geomagnetic qualities and the potential for and possible consequences of a geomagnetic shift.